Greetings, welcome back to Leicester where I’m trying to use a plug in tactic to see if I can achieve anything like the success I do on the old CM series using the same tactic regardless of the situation. So far, it’s going ok. The tactic involves both teams scoring a load of goals and most of our success come away from home, which the Leicester faithful must love. With that in mind, we’re off to West Ham. You can catch up with Part 2 here. Now, West Ham aren’t very good at home in real life so this should be interesting. Jordan Ayew really was an inspired signing. By our standards, that is a convincing win. It sets us up nicely for our Carabao Cup tie with Newcastle, the latest chance we have to win over the home fans. It’s a much-changed team, mainly because they’re all complaining. The problem is all of the lads who won the league with Leicester – you know, Morgan, Simpson, Albrighton, Okazaki and co…they’re all a bit crap. Or they don’t fit my formation. They’re all clubbing together to tell me what a turd I am but it’s hard to care when Jordan Ayew is better than them all. 4-1 flatters us. 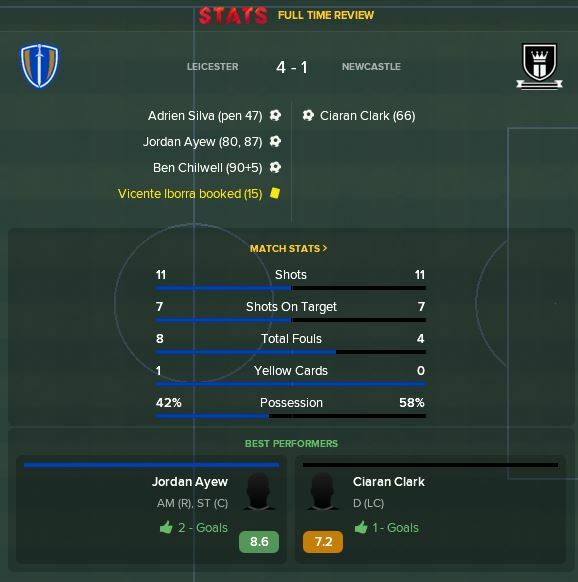 But whenever Ben Chilwell is scoring you’ve got to be happy with life. Another away game in the league awaits us. It’s back to the first team for this, no doubt big Wes will be at my door on Monday morning but I’m just not bothered. Until Nastasic’s dodgy achilles goes it’ll be cup duty for captain Morgan. Anyway, back to the matter and hand and even Dragovic scores. We’ve started to become adept at set-pieces. 2-0 becomes 2-1 and 3-1 becomes 3-2 but that’s just how we roll. Not even Lee Mason can deny us. Tell you what, this never happens. I couldn’t be happier. Unfortunately, manager of the month seems to bring an unwanted pressure for managers, especially poor ones likes me. We welcome Watford to the King Power knowing fine well we’re still not great in front of our home fans, a fear that is realised as we trail 3-0 after 40 minutes. Maguire gets one back on the stroke of half-time and I feel that is important. 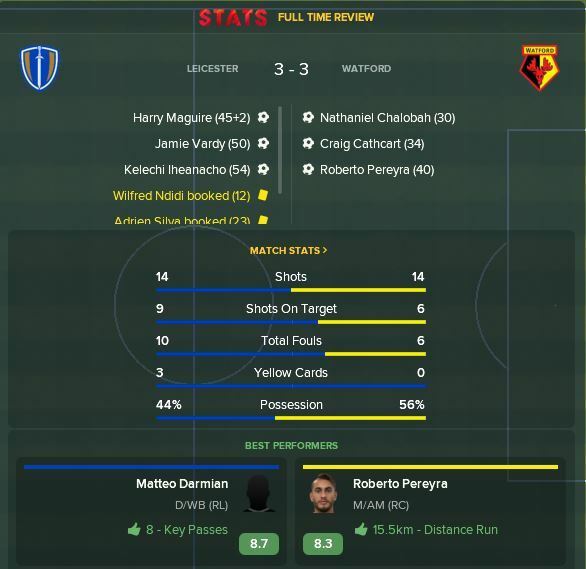 I remind the lads that even if a Watford fan is heavily involved in the game, they’re just dots to you and I (I play on 2D) and not to be overawed. 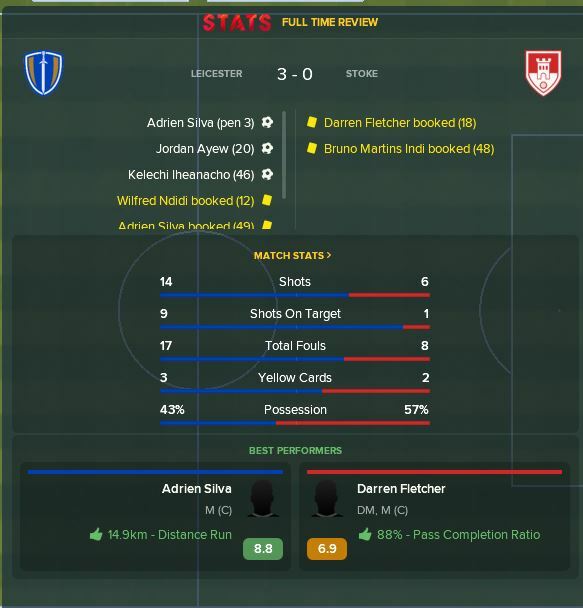 Within 9 minutes, it’s 3-3. Somehow it stays that way. 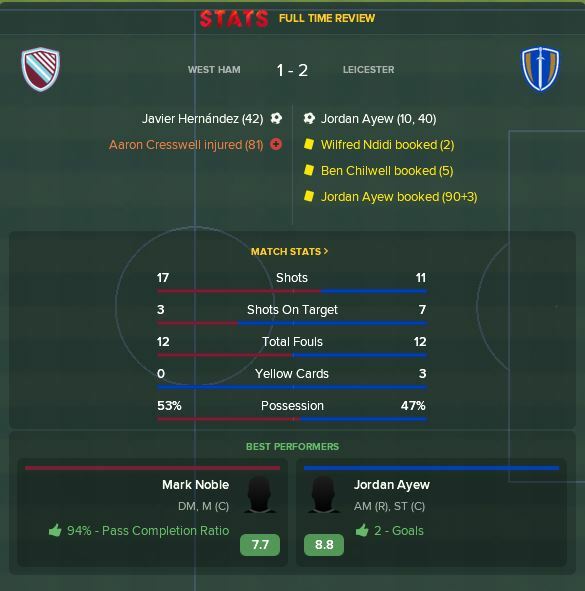 It’s like that mad play-off game all over again. 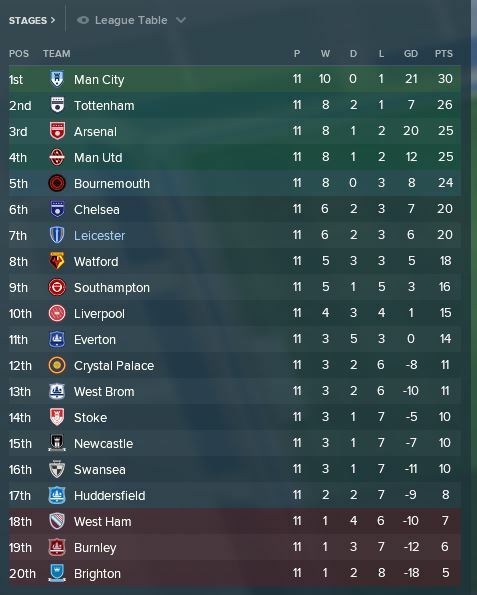 It’s time for yet another International break, which really checks my progress, but that’s 11 games in and we sit 7th. Bournemouth being 5th is a bit weird and assuming they fall away I’m hopeful of finishing in the top 6. That is a bold claim considering we are rubbish at home. In our defence, I would say we’ve played a lot of the big sides at home. Plus we’re absolutely dynamite away from home, which obviously helps. If you look at how the lads are performing, and I really encourage you to ignore Daniel Amartey, things are going really well for Ayew and Iheanacho. I’m surprised Vardy hasn’t been better but he has a lot of assists, which is fine by me. 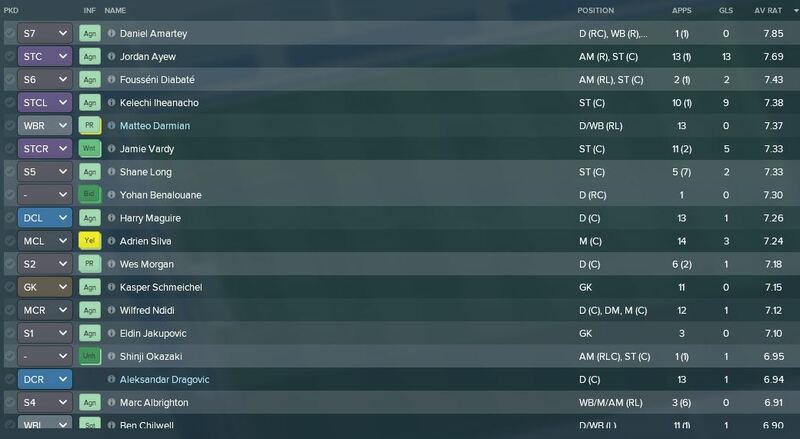 Nastasic’s rating is so bad he doesn’t even make the cut for the screenshot. Maybe Wes is right? Darmian has been the biggest surprise, whilst there’s a lot of anger in the squad as they all take sides when various players kick off. It’s tiresome. Diabate has been great in his cup cameos even if he’s still training up to be a complete forward, he’s got all the attributes. Benalouane has complained but I don’t really care so he’s going to Lyon on January 1st. Iborra is also complaining, I said something to the press about him and he’s taken it as a promise he can leave in January. Again he’s so poor he doesn’t make the cut so frankly is it my problem? I’ll take the money and run. Maybe Amartey could replace him, he seems to be loving life. That’s it for another update, I’ll be back next Wednesday with another update and with Internationals out of the way for the year we should get a good run of games. Toodles for now.